Helps to heal cuts, grazes and rashes. Ouchie Powder is a topical powder designed to help treat grazes, cuts and rashes. Ouchie Powder is naturally antibacterial and anti-inflammatory and can be used as a natural alternative to antiseptic cream for healing wounds. The natural coagulant properties help stop bleeding quickly and promote rapid healing of cuts and wounds. The powder helps to stimulate circulation, promotes cell and tissue regeneration, soothes and relieves itching as well as reduce swelling. 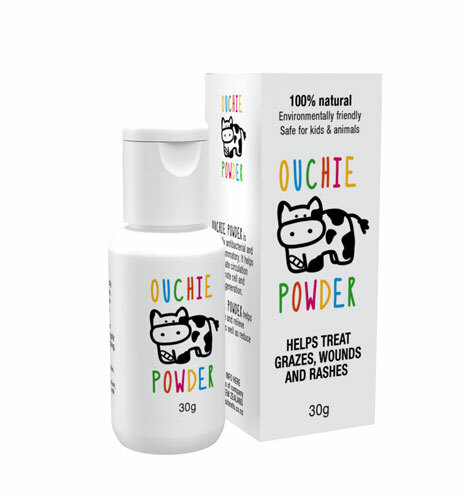 Ouchie powder is a product of New Zealand and sourced from the dairy products of animals raised in the most pristine environment on the planet.Packaged in a convenient 30gm bottle, Ouchie powder is designed to be on hand when you need it. Keep one in the glove box of your car, one in your bag or toolbox. Cuts, grazes, rashes and wounds can really ruin a good time, but with Ouchie Powder always in reach, you'll be able to get back to it in no time at all. 3. Its convenient to carry with you. 4. It works in places that are difficult to apply plasters and bandages. 5. It is a natural skin healing product.